The grantor to a quitclaim deed executed in Tennessee must sign the document and have his or her signature acknowledged. A legal description of the real property as well as a recital of the grantor's source of title must be included in a quitclaim deed executed in Tennessee. Specific requirements involved in presenting a quitclaim deed to a register of deeds in Tennessee are listed according to county. It is important to abide by these requirements in order to avoid penalty fees or re-recording. 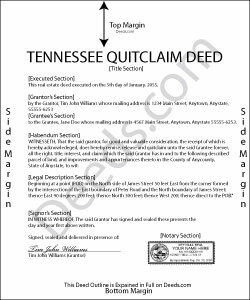 In Tennessee, quitclaim deeds are registered rather than recorded. The recording statute (Tenn. Code Ann. 66.26.101) says that all instruments authorized to be recorded will be valid between parties to the instrument and their heirs and representatives without registration. However, registration is needed in order to provide actual notice to third parties. An unregistered quitclaim deed is not valid as to existing or subsequent creditors without notice or bona fide purchasers without notice (Tenn. Code Ann. 66.26.103). Priority is given to the quitclaim deed that is registered first, unless the party claiming under a subsequent instrument had full notice of the previous instrument (Tenn. Code Ann. 66.26.104).